Indoor air quality has received wide spread attention due to the recognition of the presence of diverse toxic volatile organic compounds (VOCs) and their harmful impacts on human health. This review discusses the chemicals in indoor air and their sources and associated chemical (primary/secondary) reactions. The merits and demerits of commercially available adsorbents and synthetically prepared carbon/non-carbon-based adsorbents for indoor air sampling are discussed. Also, important parameters (like breakthrough volume, specific adsorption capacity, reaction mechanism, and desorption efficiency) are evaluated. The recent advancements in analytical techniques and insight into the complexity involved in air sampling are emphasized. The application of commercially available adsorbents and synthetically prepared carbon/non-carbon-based adsorbents for indoor air sample collection are discussed. The increasing emissions of diverse forms of VOCs are attributable to the rapid increase in urbanized population and excessive use of synthetically prepared chemical-based consumer products (U.S. EPA, 2011, 1999). Among the various VOCs observed in indoor air samples, the compounds like 1,4-dichlorobenzene, isopropyl-benzene, 1,2-dichloroethane, naphthalene, benzene, chloroform, ethylbenzene, styrene, tetrachloroethene, trichloroethylene etc., are identified as carcinogens (Chin et al., 2014; U.S. EPA, 2011). The most commonly observed priority indoor air VOCs are acrolein, benzene, acetaldehyde, 1,4-dichlorobenzene, 1,3-butadiene, naphthalene and formaldehyde (Chin et al., 2014). The World Health Organization (WHO) recognized benzene, styrene, toluene, trichloroethylene and tetrachloroethene as the priority pollutants in indoor atmosphere. Similarly, benzene, naphthalene and formaldehyde are commonly identified in indoor air samples and considered as the priority pollutants in most of the European countries. The presence of most commonly identified VOCs and their maximum concentration in indoor air samples are given in Fig. 1. The concentration (μg m-3) of most commonly identified VOCs present in indoor air (Adopted and modified from U.S. EPA, (2011) report no 530-R-10-001). The importance of air quality in indoor environment particularly in industrial buildings, residences, schools, hospitals, market place, restaurants, etc., and their impacton human health and environment have been increasingly understood (Kataoka et al., 2012). Among various pollutants in indoor, VOCs are well-known for toxic and harmful effects as carcinogen or mutagen(Wolkoff, 2018). There are various sources of VOCs with different types and nature (e.g., adhesives, carpet, paints, printers, cleaning products, deodorizers, linoleum, textiles, wall covering, furniture, window shades, flooring adhesives, house hold cleaning products, personal care products, and dry-cleaned clothing) that have been studied extensively (Lucattini et al., 2018; Bulian and Fragassa, 2016; Can et al., 2015; Dinh et al., 2015; Barrese et al., 2014; Kim and Kim, 2014; Lim et al., 2014; Liu et al., 2013; Kabir and Kim, 2011; Kim et al., 2011; Bernstein et al., 2008; Kwon and Jo, 2007; Mendell et al., 2007; Lee et al., 2006; Yu and Crump, 2003; Igielska et al., 2002; Räisänen et al., 2001). The types and nature of VOCs emitted from different indoor sources are given in Table 1. List of VOCs identified in indoor environment and their possible sources. The concentration of VOCs present in indoor is much higher than those present in outdoor (Mirzaei et al., 2016; Tiwary and Colls, 2009). The outdoor reaction is predominantly controlled by intense solar radiation where the concentration of VOCs present is much lower than that of indoor condition (Morrison et al., 2015; Panagiotaras et al., 2014). Indoor concentration of VOCs is controlled by many factors such as the nature of source, outdoor air quality, degree of ventilation, air exchange rate, and pollutant depletion mechanisms (Panagiotaras et al., 2014). A major shortcoming of the existing standards for qualitative and quantitative estimation of VOCs in indoor air samples are: (i) diversities of VOCs released from various sources and associated technical difficulties in their quantitation, (ii) difficulties in the development of standard methods for sorptive capture for all VOCs without recovery issues (e.g., due to large differences in chemical and physical properties of the VOCs), (iii) selection of commercial sorbent for VOCs sampling without doing initial assessment, (iv) oxidation reaction of VOCs with O3 which is coming through ventilation system, (v) formation of intermediate products and secondary aerosol formation, and (vi) influence of other factor such as artifact levels due to the improper sorbent conditioning, moisture content, temperature and wind velocity. As such, all these issues remain a challenging task and require in-depth research. In this review, merits/demerits of thermal-desorption techniques are discussed in association with adsorbent materials along with the current status of VOCs emission in indoor environment. The challenges involved in the identification of secondary organic aerosol (SOA), stable intermediates produced during the formation of radical reaction, sampling strategies and recent progress in analytical advancement in VOCs analysis are also discussed. Chemical reaction in indoor environment is a complex one and many factors (such as climate and ventilation, cleaning conditions, properties of buildings, nature of house-holds products, and habits) are involved in controlling the VOCs emissions. Chemical reaction of VOCs in indoor environment is mainly initiated in the presence of O3 and •OH or other radicals (Waring and Wells, 2015). In indoors, laser printers, photocopiers, electrostatic air cleaners, and fresh air coming from ventilation system are the main source of O3 (Britigan et al., 2006). Similarly, the reaction between O3 and alkene emitted from the indoor are the main source of •OH radical generation (Fig. 2). Air coming through ventilation system may also contain alkenes such as isoprene, terpene etc. emitted from several plant species of different genera. Further, alkenes and their derivatives emitted from indoor sources such as cleaners, air fresheners, wood and personal care products are also subjected to readily undergo oxidation reaction (reaction rate 10-4 -10-2 ppb-1 h-1) with O3 (Waring and Wells, 2015; Nazaroff and Weschler, 2004; Hodgson et al., 2002). Reaction of O3, NO3 and OH radicals with alkenes and other VOCs, and formation of SOA, stable intermediates and other possible reaction. The important reactions that are taking place in indoor environment are (i) reaction of O3 with unsaturated hydrocarbons, (ii) generation of •OH radicals by the reaction with O3 and NOx, (iii) decomposition of PAN (peroxyacetyl-nitrate), (iv) free radical reaction with VOCs, and (v) other heterogeneous reactions (Weschler and Carslaw, 2018; Araki et al., 2009; Weschler, 2004; Weschler, 2001; Roumelis and Glavas, 1992). Note that the reactions described above for the indoor environment are thermodynamically favorable. Hence, due to the absence of sun light, their reaction rate is much lower than that in outdoor condition (Ingrosso, 2002; Weschler, 2000). •OH and NOx are nonselective in nature and readily react with a wide range of VOCs, O3 has high affinity towards alkenes such as d-limonene, α-/β-pinene, terpinolene, γ-terpinene, α-terpineol, linalool, dihydromyrcenol, etc. (Mellouki et al., 2015; Waring and Wells, 2015; Atkinson and Arey, 2003; Arey et al., 1990). In indoors, terpenes can react with O3 to form a precursor for the secondary aerosol and other intermediate products (Wolkoff et al., 2006; Sarwar et al., 2004). The emission of secondary or intermediate products can be much more toxic to the human health than the primary VOCs (Kruza et al., 2017). O3 readily reacts with unsaturated hydrocarbon or other compounds present on solid surface (such as furniture, carpet, wooden floor, and painted wall) to liberate a range of higher aldehyde, ketone, and secondary aerosol (Morrison, 2015; Waring and Siegel, 2013; Hodgson et al., 2002). The possible surface reaction of O3 with alkene present in the solid surface is given in Fig. 3a and b. Surface reaction of O3 with unsaturated alkene (a) formation of alkyl ketone and Criegee intermediate, (b) Proposed pathway of limonene or cyclic monoterpene reaction with O3 and formation of ketone, formaldehyde and SOA (adopted and modified from Weschler et al., 2000 and Donahue et al., 2007). The secondary emission or intermediates formed during the reaction of alkene (or VOCs) by O3 or HO• radicals in indoor condition is poorly identified (Kataoka et al., 2012). Weschler et al. (1992) reported the considerable enhancement of formaldehyde, acetaldehyde, and other aldehydes (C5 to C10) concentration during the reaction of O3 with carpet emission such as 4-phenylcyclohexene (PCH), 4-vinylcyclohexene (VCH), and styrene in a confined condition. In contrast, in the absence of O3 there was no significant change in the concentration of formaldehyde, acetaldehyde, and other aldehydes (Weschler et al., 1992). The above observations clearly indicate the oxidation of alkenes with O3 and formation of formaldehyde, acetaldehyde, and other aldehydes in indoor air condition (Salthammer et al., 2010; Wolkoff et al., 1997). Like O3, nitric oxide (NO) also comes through air ventilation system while it can also be generated by indoor combustion process (Skalska et al., 2010; Ingrosso et al., 2002). In indoor condition, O3 readily undergo series of reaction with NO and forms of NO2, NO3, N2O5, and HNO3 as given in the equations (1) to (4) (Skalska et al., 2010). Further, NO3 can react with alkene and generate alkyl peroxyl radical as given in equations (5) and (6) (Ingrosso et al., 2002). These reactions are most favorable for unbranched alkenes. Similarly, peroxyacyl nitrate present in the indoor air are thermally unstable and readily undergo decomposition reaction to yield peroxyacyl radicals and NO2 (eq. 7) (Zhang et al., 2015; Ingrosso et al., 2002). As seen in Fig. 2, the indoor reactions are complicated while highly dependent on the combined effects of both chemical (O3, NOx, alkenes, and other VOCs) and physical parameters (e.g., humidity, temperature, ventilation rate, and light intensity). Further, most of the above conditions are completely different from one location to another (Morrison, 2015). The use of carbon and noncarbon based materials as sorbent for the removal of VOCs from ambient air and indoor environment have been extensively studied by various research groups (Vellingiri et al., 2017). The carbon and noncarbon-based materials used for the removal of VOCs are discussed in the following section. Carbon is one of the important and most effective sorbents for the collection of various forms of VOCs. The important allotropes of carbons (e.g., amorphous, diamond, graphite carbon, fullerenes, nanotubes, and graphene) have been extensively studied for a wide range of applications (Yoshimura and Senthilnathan, 2017). The property of each allotrope is different from the other. For example, activated carbon is amorphous in nature and extensively used for adsorption process. Whereas, diamond is a crystalline carbon (sp3 carbon), nonconductive and highly inert in almost all the conditions (Senthilnathan et al., 2014). The other allotropes (such as graphite carbon, fullerenes, nanotubes, and graphene) are crystalline and highly conductive in nature with very high surface area (Agnihotri et al., 2005). Among the various carbons, activated carbon, granular activated carbon (GAC), singled and multiwalled carbon nanotubes (SWCNTs and MWCNTs) have been studied extensively for the removal of diverse nature of organic compounds (Li et al., 2011; Oh et al., 2010; Delage et al., 2000). Among these, activated carbon is the extensively studied adsorbent due to its large surface area, porous structure, chemical stability, cost effectiveness, eco-friendly, great accessibility and simple procedures involved in the synthesis process. The main mechanism involved in the adsorption of VOCs on GAC are physical or chemical adsorption of the target compounds on the pore wall, pore diffusion and others like convection, axial dispersion, liquefaction, condensation etc. (Dobre et al., 2014). VOCs, which have a high boiling points and high molecular weights readily undergo capillary condensation and considerably increase the specific adsorption capacity (Li et al., 2012). The adsorption of nonpolar VOCs like benzene, toluene, xylene etc., on GAC mainly follow van der Waals force of attraction or physical adsorptions. A highly polar compound like acetone which has a molecular diameter (0.308 nm) less than the pore diameter of adsorbent, follow pore diffusion mechanism (Li et al., 2004). The adsorption property of GAC depends on various factors that includes size and shape of the adsorbent, particle density, surface area, pores size, porosity, void fraction etc. (Dobre et al., 2014; Bhargavi et al., 2011). The nature of the VOCs and their chemical/physical properties (such as boiling point, vapor pressure, size, and concentration) are also important controlling factors for the adsorption process (Dobre et al., 2014; Kawasaki et al., 2004; Chuang et al., 2003). Nanocarbons such as SWCNTs and MWCNTs have been used as the adsorbent for the removal of aliphatic VOCs such as methane, methyl ethyl ketone, hexane, butane and n-nonane and aromatic hydrocarbon like toluene, cyclohexane and benzene from ambient air sample (Agnihotri et al., 2007; Crespo and Yang, 2006; Hilding et al., 2004; Talapatra and Migone, 2002; Iijima, 1991). The adsorption of various VOCs using MWCNTs and SWCNTs from ambient and indoor environment and their percentage of recoveries, maximum adsorption capacity, and breakthrough volume are given in Table 2. Both SWCNTs and MWCNTs follow heterogeneous adsorption mechanism due to the presence of high energy defective sites, oxygen functional groups, and interstitial and groove regions between CNT bundles (Pan and Xing, 2008; Fagan et al., 2004; Hirsch, 2002; Zhao et al., 2002). Further, SWCNTs and MWCNTs facilitate a surface and/or capillary condensation of gas when VOCs contact with the surface leading to a multilayer adsorption or surface condensation (Pan and Xing, 2008; Gotovac et al., 2007; Gotovac et al., 2006). SWCNTs and MWCNTs adsorbents highly favor the adsorption of high molecular non-polar aromatic organic compounds due to the presence of hydrophobic sites (Cho et al., 2008; Pan and Xing, 2008; Piao et al., 2008). The hexagonal arrays of sp2 carbon present in the graphene tubular sheets or CNTs highly favor the adsorption of aromatic VOCs due to the transfer of the π-electrons from the HOMO of the CNTs to the LUMO of the aromatic VOCs (Sone et al., 2008). Further, the aromatic VOCs, which have lower HOMO to LUMO gap will have a higher attraction to the CNTs. The specific adsorption capacity and HOMO to LUMO gaps of VOCs (e.g., p-dichlorobenzene, xylene, toluene, and benzene) were found to be 1048.3 μg g-1 (9.03 eV), 740.3 μg g-1 (9.63 eV), 274.1 μg g-1 (9.63 eV), and 178.6 μg g-1 (9.74 eV), respectively (Sone et al., 2008). The presence of functional groups like a hydroxy, carboxy and carbonyl groups alter the wettability of the surface, attract the partially polar and polar VOCs and reduces the affinity of non-polar compounds due to the increase in diffusional resistance (Cho et al., 2008; Piao et al., 2008; Onyestyak et al., 2004). Li et al., studied the adsorption of different aromatic VOCs like benzene, toluene, ethylbenzene and p-xylene with MWCNT and compared with Carbopack B commercial adsorbent (Li et al., 2004). The MWCNT displayed higher breakthrough volume (BTV) when compared to Carbopack B due to the presence of high pore volume which favors a pore diffusion mechanism. Similar trend was observed in alkanes (n-pentane, cyclohexane, n-hexane and n-heptane), halogenated hydrocarbon (dichloromethane, trichoromethane, tetrachloromethane and 1,2-dichloroethane) and other VOCs like acetone, ether, ethyl acetate and n-propanol (Li et al., 2004). The recovery study and break through volume (BTV) was performed with purge gas containing relative humidity of 70%. VOCs like dichloromethane, n-pentane, acetone, cyclohexane, ether, n-propanol, trichloromethane, n-hexane, benzene, n-heptane, ethyl acetate, n-butanol, ethyl benzene, toluene, p-xylene, and o-xylene showed more than 90% recovery (Li et al., 2004; Mastrogiacomo et al., 1998). Similarly, its BTV of the target VOCs showed much higher than those on Carbopack B, especially for polar compounds like dichloromethane, acetone, and n-propanol (Li et al., 2004). The high specific adsorption property and BTV is due to the open-ended, larger internal surface area and stronger binding energy of MWCNTs (Fujiwara et al., 2001; Mastrogiacomo et al., 1998). 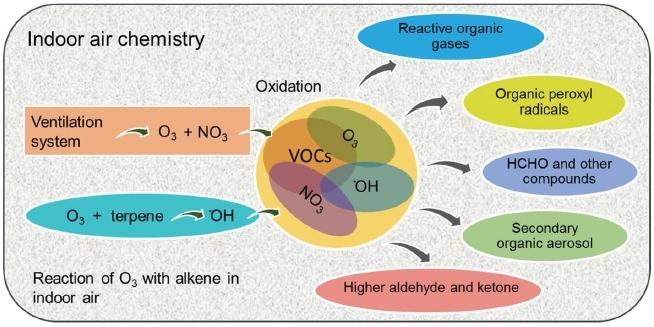 Liu et al., studied the BTV of VOCs (1,2-dichloroethane, benzene, toluene, n-heptane, ethylbenzene, p-xylene, m-xylene, styrene and o-xylene) with MWCNTs adsorbent connected in a series along with Tenax TA and Corboxen 564 (Standard mixture: 10 μg L-1 flow-rate 0.1 L min-1) (Liu et al., 2008). The BTV and the safe sampling volume of MWCNTs sampling tube was found to be in the range of 10-70 L g-1. Similarly, the breakthrough and safe sampling capacity were found to be 100-700 μg g-1, which clearly shows that the MWCNTs can be used for the air sampling application with suitable modification (Liu et al., 2008). Comparison of breakthrough volume, recoveries and adsorption capacities of different MWCNT for the sorption of VOCs. Metal-Organic Framework (MOF) have emerged as novel crystalline materials which have ultrahigh porosity and surface areas (Langmuir surface area of 10,000 m2 g-1) (Kumar et al., 2016; Zhu et al., 2014). MOF has wide range of applications that includes sorbent, sensing, catalytic, gas storage, separation, proton conduction, drug delivery etc. (Zhu et al., 2014; Meek et al., 2011; Umeyama et al., 2011; Horcajada et al., 2010; Chen et al., 2007). MOFs based porous adsorbents have been extensively studied for the removal of VOCs from indoor and ambient air by various research groups due to its large pore volume, high surface area (>3000 m2 g-1), availability of unsaturated metal sites etc. (Meek et al., 2011; Yang et al., 2011). In MOFs, metal cation and organic ligand are linked through coordination or strong metal-ligand bonds (Meek et al., 2011; Nicolau et al., 2009). Among different MOFs such as MOF 5, MOF-74, MOF-177, MOF-199, MIL-47, MIL-96, Zn (BDC)-(Dabco)0.5, IRMOF-3 and IRMOF-62, the MIL-101 (Cr3F(H2O)2OE(O2C)-C6H4-(CO2)3·nH2O; n is~25) is one of the most studied MOFs for the adsorption of various VOCs (Yang et al., 2011). Further, MIL-101 frameworks have large cell volume, large surface area, highly mesoporous (12 and 16 A in diameter) and unsaturated metal sites (Hong et al., 2009). The highly porous nature of MIL-101 is extensively used for the adsorption of different VOCs like acetone, benzene, toluene, methane, alkane, butane, xylene, hydrocarbon etc., due to its high pore volume (≈2.0 cm3 g-1) and surface area (5900±300 m2 g-1) (Huang et al., 2011; Yang et al., 2011; Gu et al., 2010; Klein et al., 2010; Trung et al., 2010; Llewellyn et al., 2008; Jhung et al., 2007; Ferey et al., 2005). Various forms of MOFs and their physical and adsorption properties such as breakthrough volume, surface area and adsorption capacity of different forms of VOCs are given in Table 3. The adsorption of VOCs on the MOFs surface follows predominantly pore-filling, π-complexation and van der Waals force mechanism (Yang et al., 2011). Vellingiri et al. (2016) studied adsorption properties of four different aromatic VOCs (benzene, toluene, p-xylene and styrene) and 10 semi-volatile organic compounds (volatile fatty acids, phenol, indole etc.) with MOF-5, Eu-MOF, and MOF-199 adsorbents. The outcome of the results was compared with commercially available adsorbents like Tenax TA, Carbopack-X, and Carboxen-1000 at ambient condition. The MOF-199 and Eu-MOF showed mean equilibrium adsorption capacities for benzene, toluene, p-xylene and styrene to be >13.8 and 3.56 mg g-1, respectively (15 L of a ~100 ppb (~0.01 Pa) gaseous standard loaded at ~25°C). Whereas, the mean equilibrium adsorption capacities of VFAs (MOF-199: 18.6 and Eu-MOF: 15.3 mg g-1), phenol (MOF-199: 28 and Eu-MOF: 4.8 mg g-1) and indole (MOF-199: >71.7 and Eu-MOF: 27.9 mg g-1) showed much higher adsorption properties when compared with aromatic VOCs. Furthermore, MOF-199 displayed much higher adsorption properties due to the presence of strong π-π interactions and polarity of the guest molecule (Vellingiri et al., 2016). Yang et al. (2011) reported that MIL-101 possess superior property for the removal of different VOCs such as acetone, toluene, benzene, ethylbenzene, o-xylenes, p-xylene and m-xylene. In this study, the adsorption mechanism of different VOCs is discussed with pore diffusion mechanism and shape and structure of the target VOCs. The experiments were conducted in two different relative pressure (P/P0<0.1 and at P/P0 from 0.1 to 0.2) for VOCs such as acetone, toluene, benzene, ethylbenzene and xylene on MIL-101. The VOCs like acetone, benzene and toluene showed higher adsorption efficiency even at low relative pressure of P/P0<0.1. Whereas, ethylbenzene and xylenes did not show any amount of adsorption on MIL-101 at low relative pressure (Yang et al., 2011; Tolmachev et al., 2009; Guo et al., 2000). When the relative pressure is increased more than 0.1, considerable amount of ethylbenzene and xylene are adsorbed on the MIL-101 (Yang et al., 2013, 2011; Hartmann et al., 2008). This clearly shows that at low relative pressure, large cross-sectional molecule like ethylbenzene and xylene are difficult to accommodate in the pores of the MIL-101 (Yang et al., 2013, 2011; Alaerts et al., 2007). The above observation shows that the pore filling mechanism is highly favoring the adsorption of smaller cross-sectional compound like benzene (0.34 nm2) (Vellingiri et al., 2016). Apart from pore filling mechanism, other factors like compound polarity and electron density also play a role in the adsorption of VOCs on MOF. For example, acetone has smaller cross-sectional area (0.269 nm2) showing a much lower absorption capacity on MOF-177. This might be due to the strong polar nature of acetone inhibited by the strong π-π coupling or electron cloud (Vellingiri et al., 2016; Yang et al., 2013, 2011). Huang et al. (2011) reported that the heterogeneous nature of MIL-101 surface shows strong adsorption properties of heteroatoms containing molecules like n-butylamine or dichloromethane rather than n-hexane and toluene. Further, toluene displayed higher adsorption than n-hexane due to the π-π interaction between MIL-101 and toluene (Huang et al., 2011). Similarly, adsorption of benzene on MIL-101 showed 1,304 mg g-1 specific adsorption value when compared to activated carbon and zeolites (Jhung et al., 2007). 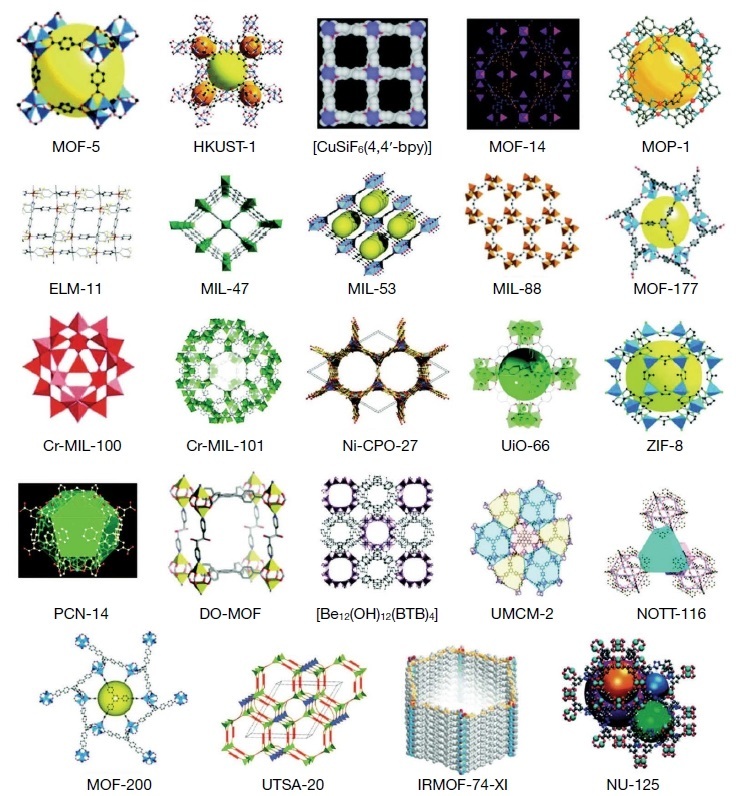 The different types and properties of MOFs have been extensively studied by various research groups and their possible crystallographic structure are given in Fig. 4. The main advantage of use of MOFs as adsorbent for the removal VOCs are their non-toxicity, high chemical/thermal stability, high internal surface area, porosity, pore volume, selectivity, tunable porosity and chemical functionality (Vellingiri et al., 2016). Further, materials of this kind can be good replacement for the materials like zeolites, activated carbon and some of the commercially available adsorbents. The major shortcoming of MOFs is that their adsorption kinetics are much lower when compared to the commercial adsorbents. In addition, most of the procedures, chemicals or ligands used as the precursor for the formation of MOFs are very expensive. Further, the long-term stability and reusability has to be studied in detail. Hence, a low cost and environment friendly approach should be adopted for the larger scale synthesis. Adsorption capacities of metallo organic framework and other adsorbents for selected VOCs (adopted and modified from K. Yang et al. Journal of Hazardous Materials 195 (2011) 124–31). Porous MOFs prepared by several research groups aiming the accommodation/retention of chemical species in their pores/channels (reproduced with permission from Ref. (Silva et al. (2015) Chemical Society Reviews 44, 6774-6803), ⓒ Elsevier 2015). Note: MOF 5: Zn4O(BDC)3, BDC =1,4-benzodicarboxylate; HKUST 1: [Cu3(BTC)2(H2O)3] (BTC: Benzene-1,3,5-tricarboxylate); BPY=bipyridine; MOF 14: (Cu3(BTB)2, BTB=4,4ʹ,4ʺ-benzenetribenzoate); ELM-11: [Cu(BF4)2(4,4ʹ,-bipyridine)2]. The accurate measurement of VOCs present in the indoor environment requires highly advanced instrumental systems which demand the proficiency of operator and minimal intervention of unwanted steps to reduce the analytical errors (Schripp et al., 2014). The important factors involved in the indoor sampling process are the VOCs coming from outdoor air, temperature, wind direction, air exchange rate, humidity, barometric pressure, sampling time, duration, quality assurance etc. (Panagiotaras et al., 2014). Qualitative and quantitative analysis of VOCs present in indoor air sample is accomplished by active or passive sampling techniques. In active sampling, VOCs are concentrated in a suitable sorbent connected with a pump which will regulate flow rate of the sampling (U.S. EPA, 1995). The time and flow rate needed for their sampling should be adjustable depending upon nature of VOCs and sorbent used. At the end of the sampling, VOCs will be desorbed from the collection tube using either solvents or thermal desorption technique for the final quantitation by gas chromatography (GC) and GC mass spectroscopy (GC-MS) methods (Mirzaei et al., 2016; U.S. EPA, 1995). Diffusive or passive sampling of VOCs does not require a pump as the sampling is completed by the natural flow (or diffusion) of air through the sorption media. Similarly, direct collection of air sample using Tedlar bags is one of the simplest processes. The accuracy of the VOCs measurements in indoor air by the use of above techniques depends upon different factors such as sorption capacity of the VOCs, sampling location, desorption capacity of sorbent, and sensitivity of the analytical instruments (Destaillats et al., 2008). Preconcentration of indoor and/or ambient air is one of the important steps in sampling process. The main advantages of active sampling preconcentration step into solid adsorbent are (i) the use of multi-sorbent beds which can capture wide range of VOCs, (ii) high preconcentration efficiency, (iii) provision of addition moisture trap which completely eliminate the interference of water molecule in the preconcentration of VOCs (Ras et al., 2009; EPA, TO-17). Whereas, passive sampling is a simple process and no pump or flow meter device is required. The main disadvantages of passive sampling process are (i) nonappropriate, if the fluctuation is there in VOCs concentration in the ambient air, (ii) preconcentration efficiency is less effective when compared to active sampling, and (iii) preconcentration is affected by temperature variation and air movement (Ras et al., 2009; Destaillats et al., 2008). The Environmental Protection Agency (U.S. EPA, 1999a, b) methods such as TO 1, 2, 14, 15 and 17 are used to analyze VOCs samples collected on a single and multi-bed sorbent tubes in both indoor and ambient air samples (U.S. EPA, 1999a, b, 1990, 1984). The U.S. EPA - method TO 1 recommends the use of Tenax GC cartridge for the sampling of volatile and nonpolar aromatic and chlorinated hydrocarbons which have a boiling point between 80 to 200°C by the use of GC-MS or GC-FID (Fig. 5). Similarly, the method TO 2 recommends the use of carbon molecular sieve cartridge for the sampling of highly volatile and aliphatic/aromatic nonpolar organic compounds like benzene, toluene, xylene, vinyl chlorine etc., which have a boiling point between -15 to 120°C by the use of GC-MS or GC-FID (Fig. 5). The US EPA - method TO 14 and 15 describes the use of specially prepared canister for the sampling of volatile and nonpolar organics (e.g., toluene, benzene, chlorobenzene) and volatile and polar/non-polar organics (e.g., methanol, benzene, toluene, xylene, nitrobenzene etc.) (Panagiotaras et al., 2014; U.S. EPA, 1999a, b, 1990, 1984). In contrast, the method TO 17 recommends the use of multi bed adsorbent tube to cover both polar and nonpolar organic compounds (e.g., alcohols, ketones, benzene, toluene, o-xylene, and chlorobenzene) (Panagiotaras et al., 2014; U.S. EPA, 1999a, b). There are different types and nature of sorbents commercially available for the sampling of a range of VOCs present in the ambient and indoor air. The important criteria for the sorbents are: (i) the sorbent should have a high surface area and/or pore volume to display a complete sorption of the target compounds, (ii) high BTV of the compound, (iii) good desorption property, (iv) nonreactive with reactive species like O2, water and other gases (e.g., NOx, SOx, CO2 , and O3), (v) reusability, and (vi) thermal stability (Dettmer and Engewald, 2002). In light of the significance on the selection of suitable sorbent for the sampling VOCs, there are a few important parameters that have to be considered before sampling. If the boiling point of the target compound is high (e.g., >100°C), a weak strength sorbent such as Tenax TA, Tenax GR, and Carb 2TD can be used (Panagiotaras et al., 2014). Similarly, if the boiling point is ranging between 30-100°C, sorbents of medium strength like Carbotrap B, Carbotrap C and Carbograph 1TD) can be used. If the boiling point of the compounds is fairly low (e.g., -30 -50°C), high strength sorbents like Carbotrap X, Carboxen 1000, Carbosieve SIII or equivalent sorbent can be used. The thermal stability of the sorbent is also one of the important factors for sorbent selection (e.g., graphitized carbon blacks and carbonized molecular sieves >400°C). Further, inertness (porous polymers and carbonized molecular sieves) and hydrophobicity are also important factors to be considered (U.S. EPA, 1999a, b). As such, commercially available sorbent tubes are compatible with a wider range of VOCs which have wider volatility and polarity (Watson et al., 2011). There are four important categories of commercially available sorbents are Carbon Molecular Sieves (CMC), Graphitized Carbon Block (GCB), Porous Organic Polymers and other sorbents (Glass beads, Silica gel 15, Petroleum charcoal, Coconut charcoal etc.) (Dettmer and Engewald, 2002). The adsorption and desorption properties purely depend on chemical nature, shape and size of the molecule. The Carbosieve (SI, SII and SIII) and Carboxene (Carboxen - 563, 564, 569, 1000, 1001, 1002, 1003, 1016 and 1018) are the two main classes of the CMC sorbent. The Carbosieve S-II is very effective against the VOCs such as ethane, ethylene, acetylene and methane (C1-C2). Among CMC family, Carbosieve S-III is one of the strongest adsorbent, which has the surface area of ~820 m2 g-1 and pore size of 15-40 A. Similarly, Carboxene group of adsorbents (Carboxen - 563, 564, 569, 1000, 1001, 1002, 1003, 1016 and 1018) are hydrophobic in nature, which have a surface area in the range of 400 to 1200 m2 g-1 and the maximum desorption temperature is >400°C (U.S. EPA, 1999a, b). GCB adsorbent provides a weaker adsorptive strength compared to CMC adsorbents. There are different types of GCB adsorbents such as Carbopack - F, Carbopack - C, Carbopack - Y, Carbopack - B and Carbopack - X available in market. GCB are hydrophobic in nature and their surface area are in the range of 5 to 240 m2 g-1. Porous organic polymers such as Tenax TA (2,6-diphenyl-p-phenyleneoxide), Tenax GR (30% graphite and 2,6-diphenyl-pphenyleneoxide), Porapak N (Divinylbenzene/copolymer ethylene glycol dimethylacrylate), Chromosorb 106 (cross linked poly styrene) and HayeSep D (divinyl benzene) are granular sorbents with a surface area in the range of 24 to 795 m2 g-1. Porous organic polymer sorbents are effective against adsorption and desorption of mid to large molecular weight compounds and their desorption temperature is in the range of 220°-350°C (WHO, 1989). Among different porous organic polymers, Tenax TA is one of the widely used adsorbents for the pre-concentration of VOCs and it is very effective against high boiling VOCs which have a boiling point of more than 100°C (Gallego et al., 2010; Ras et al., 2009). The most commonly used commercially available sorbents and their properties are given in Table 4. U.S. EPA Compendium methods TO-1 (TenaxⓇ-GC adsorption and GC/MS or GC/FID analysis), TO-2 (molecular sieve adsorption and GC/MS or GC/FID analysis), TO-3 (Cryogenic preconcentration and GC (FID/ECD) detection), TO-4A (Pesticides and PCBs using polyurethane foam sampling with GC (GC/MD), TO-5 (Aldehydes and ketones in ambient air using HPLC, TO-6 (Phosgene in ambient air using HPLC, TO-7 (N-NDMA in ambient air using GC), TO-8 (Phenol and Cresols in HPLC), TO-9 (Dioxin/Furan/PCBs in ambient air), TO-10 (PUF adsorbent and GC/ECD/PID/FID analysis), TO-11A (Aldehydes and ketones using DNPH-cartridge HPLC/UV detection), TO-12 (NMOC in ambient air using cryogenic preconcentration and PDFID), TO-13A (PUF/XAD-2 adsorbent cartridge GC/MS), TO-14 (Non-polar VOCs GC/FID/ECD OR GC/MS detection), TO-15 (Polar/non-polar VOCs by GC/MS), TO-16 (Polar/non-polar VOCs by FTIR open path spectroscopy and TO-17 (Multi-bed adsorbent tube by GC/MS (adopted and modified from U.S. EPA, 1999a, b). Important commercially available sorbents for the adsorptive enrichment and thermal desorption in ambient/indoor air analysis. Gas Chromatography (GC) and GC - Mass Spectroscopy (GC-MS) techniques have been extensively studied for the qualitative and quantitative analysis of diverse nature VOCs present in the ambient and indoor environment. Further, it can provide a separation and retention time data of VOCs which is not possible in most advanced technique like PTR MS (Kaser et al., 2013; Biasioli, 2011a). However, GC-MS is highly time-consuming process and not suitable for the real time online monitoring of VOCs. Recently different types of instruments are available for the real time online monitoring of VOCs such as proton transfer reaction time of flight mass spectrometer (PTR-TOF-MS), proton transfer reaction quadrupole mass spectrometer (PTR-MS), fast-online gas-chromatograph coupled to a mass spectrometer (GC/MS; TOGA), thermal dissociation chemical ionization mass spectrometer (PAN-CIMS) etc. (Kaser et al., 2013). Among various types and combination, PTR MS is the commonly used technique for real-time monitoring of VOCs, which do not require any pre-concentration steps and is able to detect part per billion (ppb) level concentration (Panagiotaras et al., 2014). PTR-MS system is the most advanced and highly sensitive instrument for real-time continuous monitoring of various VOCs, such as isoprene, monoterpene, acetone, acetaldehyde, methanol, benzene, xylene, ethanol, some inorganic compounds etc., which have a range of boiling points and molecular weights (Schripp et al., 2014; Han et al., 2010). PTR-MS has several advantages over GC-MS like pre-extraction or separation or sampling is not required. It shows very high sensitivity (<1 pptv) for the detection of ultralow concentration of VOCs and very efficient when compared to GC or GC-MS (Han et al., 2010; Destaillats et al., 2008). Further, PTR-MS can be used to measure a set of preselected mass with high sensitivity and high sampling frequency, which can help to quantify a very reactive, less volatile and low concentration of VOCs in an indoor air. VOCs generated from the indoor air are measured using PTR-MS, which can be adjusted to withdraw a sample for every ~5 min (suction time ~5 to 20s). Background correction is performed at regular time intervals with zero air and calibration is performed with an air mixture containing 10 to 15 different concentrations (ppb level) of VOCs, which are commonly observed in VOCs emission as specified and recommended by the manufacturer for accurate and robust operation (Schripp et al., 2014). Quadruple-based PTR-QMS can be used to monitor the emission characteristics of the source when the source VOCs emission concentration decreases with respect to time. 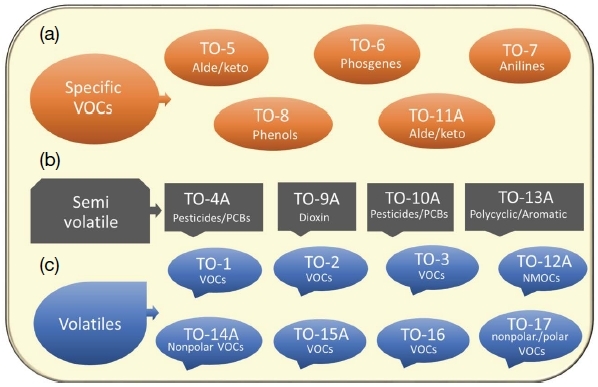 To understand the real-time indoor chemistry, Teflon coated or suitable chamber connected with target VOCs, NOx, cylinders and O3 generator can be used to the study the formation of SOA and other VOCs by PTR-MS technique. The aerosol formed is trapped in bubbler sampler by providing Teflon membrane filters and collected with ethyl acetate or suitable solvent and can be used for further analysis (Ziemann, 2003). The different types of synthetically prepared adsorbents like MOFs, MWCNTs, polymers, electrospun nanofibers, biochar, and activated carbon from various natural products are extensively studied and reported in the literature (Zhang et al., 2017). Most of the adsorbents are highly selective in nature and their adsorption and desorption properties for wider range of VOCs has to be explored in detail and not suitable for commercial application. The commercially available adsorbents are highly suitable for VOCs sampling application. The type and physical properties of commercially available solid sorbents and their possible applications for capturing ambient and indoor air samples are listed in Table 4. The main objective of the sampling process is to enrich the VOCs present in trace quantities in indoor or ambient air condition. Each adsorbent has particular retention time for adsorbing VOC and their specific adsorption efficiency for a single and mixed conditions are different from each other (Ho et al., 2018; Ribes et al., 2007). The major shortcomings of single adsorbents are (i) it is very effective for the adsorption of low concentration of VOCs and within the safe range of breakthrough volume, (ii) the adsorption/desorption properties of the sorbent against mixture or different combination of VOCs should be defined, (iii) competitive adsorption such as the presence of high and low affinity VOCs towards sorbent in the air sample is not discussed in detail, (iv) humidity and temperature can influence adsorption efficiency, and (v) stability and storage condition for the adsorbed VOCs cartridge, (vi) some of the adsorbent material (e.g., Tenax TR) are sensitive towards oxidant like O3, SOx and NOx. Further, some compounds present in VOCs exhibit dissenting properties such as strong sorption, high thermal stability, and poor desorption properties (Hafkenscheid, 1997). Tenax TA is one commonly used adsorbent for capturing of VOCs and it has a high thermal stability and low bleeding material. However, Tenax TA is very vulnerable to the oxidizing agents such as O3, NOx and SOx and also thermally decomposes to form compounds like acetophenone, benzaldehyde, phenol and some fragmented products (Ho et al., 2018). Tenax TA is a highly suitable sorbent for heptane to decane, which have a high boiling point of more than 100°C. Also, it effectively captures the aromatic compounds like benzene, xylene, toluene, trimethylbenzene and compounds like esters, ketones, chlorinated hydrocarbons, alcohols and ethers etc., (Pollmann et al., 2006; U.S. EPA, 1999a, b). BTV are low for highly volatile substances which have a boiling point less than 100°C. Tenax TA is a weaker adsorbent when compared to Anasorb GCB1, Anasorb GCB2, and Carbosieve III for the adsorption of highly volatile compounds (e.g., C2-C4). Carbosieve SIII is an efficient and the strongest adsorbent for capturing low molecular and low boiling VOCs (Badol et al., 2004; Sturges et al., 1993). Pollmann et al. (2006) studied the comparison of nine commercially available solid adsorbent such as Carboxen 1000, Carbosieve S III, Molecular Sieve 5A, Molecular Sieve 4A, Silica Gel, Carboxen 563, Activated Alumina, Carbotrap and Carboxen 1016 for the adsorption of 23 non-methane hydrocarbon (C2-C6) and methylene chloride at -10 and -30°C. The outcome of the results shows that the adsorbents like a molecular sieve 5A, Carbotrap and Silica Gel were proven to be unfit for trapping for non-methane hydrocarbon (C2-C6) and methylene chloride under given condition (Pollmann et al., 2006). Among these, Carbosieve SIII was found to be the strongest adsorbent exhibiting high adsorption properties that include ethane and ethene (Pollmann et al., 2006). Similarly, the adsorption of ethane was studied with the comparison of ten different adsorbents that includes Carbosieve S III, Carbosieve S II, Carboxen 563, Carbosieve 564 and Carbosieve 569. This showed that Carbosieve S III displayed highest efficiency when compared to rest of the adsorbents (Betz and Supina, 1989). Further, Carbosieve III showed very high adsorption efficiency for hydrohalocarbon and halocarbon when compared to Carboxen 1000 and Carboxen1001 adsorbents (Sturges and Elkins, 1993). Like Carboxen SIII, Carboxen 1000 is also a very strong adsorbent and its property is very similar to Carboxen SIII, Carboxen 1001 and Carboxen 1002. Carboxen-1000 adsorbent is stable up to 300°C and one of the disadvantages of Carboxen-1000 is adsorption of CO2 which will interfere with other compounds (U.S. EPA. 1999a, b; Sturges and Elkins, 1993). Similarly, Carbopack B (Anasorb GCB1) can effectively capture the VOCs in the range of C5-C12 and their efficiency is much higher compared to Tenax TA except for n-heptane and n-octane (Tolnai et al., 1999). It clearly indicates that Tenax TA is the ideal adsorbent for the VOCs which have a higher molecular VOCs and Carbopack B is very effective for the adsorption of low boiling or low molecular VOCs (Tolnai et al., 1999). Similarly, Carbopack C (Anasorb GCB2) can effectively capture VOCs which are in the range of C12-C20. 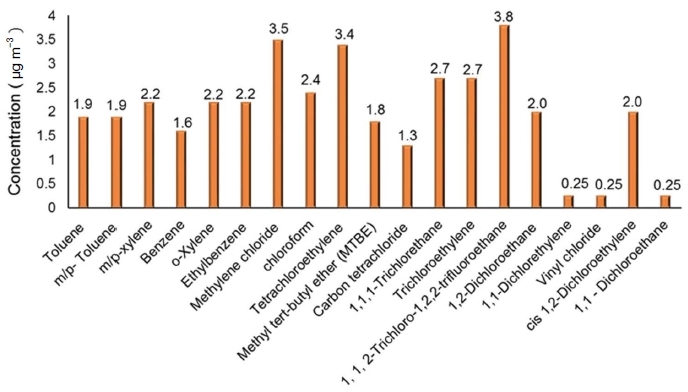 Performance metric of commonly observed aromatic VOCs (Benzene, Toluene, p-Xylene and Styrene) collected by commercially available single and multi-bed sorbents are given in Table 5. Performance matric of commonly observed aromatic VOCs (Benzene, Toluene, p-Xylene and Styrene) collected by commercially available sorbent. Indoor and ambient air contains wide range of VOCs which have different physical and chemical properties and sampling with single adsorbent is not adequate. A combination of different adsorbents or multi-sorbent bed technique needs to be adopted (U.S. EPA, 1999a, b). The commercially available multi bed adsorbent connected with a high-end analytical instrument considerably enhances the precision and accuracy of the VOCs measurements (Chang et al., 2016). The commonly used adsorbent for multi-bed adsorbents combination are Tenax TA, Tenax GR, Anasorb GCB1 (Anasorb GCB1 is equivalent to Carbopack B), Anasorb GCB2 (Anasorb GCB2 is equivalent to Carbopack C), Carbosieve III, Chromosorb 106 (U.S. EPA, 1999a, b). Generally, these adsorbents can be used in combinations of two or three or multi-bed form depending upon nature of the VOCs present in the source. If the source air sample contains VOCs in the range of C6 to C20, Tenax GR and Carbopack B separated by quartz wool is the suitable one with air volumes of 2-5 L at any humidity (Woolfenden, 1996). The multi-bed adsorbent with the combination of Carbopack B, Carbosieve SIII separated by quartz wool is highly suitable for compounds ranging from C3 to C12 with the suitable air volumes of 2 to 5 L at relative humidity less than 65% (U.S. EPA, 1999a, b; Woolfenden, 1996). Similarly, the combination of Carbopack C, Carbopack B and Carbosieve SIII with each bed separated by quartz wool is suitable for the compounds ranging from C3 to C16 for air volumes of 2 L at relative humidity less than 65% (Woolfenden, 1996). Comparison of BTV of highly VOCs (C1-C6, boiling point <100°C) collected by Carbopack X, Carbotrap, Tenax TA and Carbograph 5TD sorbents are given in Table 6. Wu et al. (2003) studied the sampling efficiency of multi-bed adsorbents (Carbopack B, Carbopack C, and Carbosieve SIII) with mixture of VOCs and observed high percentage of recovery for acetone, iso-propyl alcohol, benzene, trichloroethylene, toluene, butyl acetate, cyclopentanone, m,p-xylene, 2-heptanone, andoxylene which were 97, 95, 101, 98,97, 99, 94, 97, 100 and 96%, respectively. Pollmann et al. (2006) studied the adsorption of non-methane hydrocarbon ranging from C2-C6 using multi-bed adsorption tune packed with Carboxen 1016, Carboxen 563, and Carbosieve SIII at -10 and -30°C trapping temperature. Recovery rates for all the VOCs showed almost 95 and 100% efficiency and these findings demonstrate advantage of using multi-bed adsorbent compared to single adsorbent (Pollmann et al., 2006; Wu et al., 2003; Woolfenden, 1996). The main advantage for the use of multibed adsorbents are (i) use of multi bed sorbent considerably reduces the completive adsorption in second and third sorbent interface, (ii) it can capture wider range of VOCs, (iii) highly polar and non-polar VOCs can be adsorbed and desorbed, (vi) hydrophobic sorbents can be used to eliminate the water interference, (v) size and cost advantages in sampling equipment (U.S. EPA, 1999). The disadvantages of multi-bed adsorbent are (i) regeneration of sorbent tube is a difficult process and rigorous clean-up is needed, (ii) desorption of some VOCs are very difficult, (iii) additional thermal desorption unit has to be purchased, (vi) contamination of adsorbent can be a problem (U.S. EPA, 1999a, b). Comparison of breakthrough volume of VVOCs (C1-C6 boiling point less than ~100°C) collected by Carbopack X, Carbotrap, Tenax TA and Carbograph 5TD sorbents (modified from Schieweck et al. (2018) Analytical & Bioanalytical Chemistry 410(13), 3171-3183). Adsorption/desorption of VOCs with commercially available adsorbent using single/multi-bed adsorption tubes by both active and passive sampling provides better sensitivity, desorption efficiency, and reasonable reproducibility compared to conventional solvent extraction and other techniques. In adsorption of VOCs, sampling duration must be explored further to prevent the breakthrough of any particular VOC of interest. Further, maintaining of optimum flow rate for ambient/indoor air sample which contain mixture of VOCs has to be arrived after several trial studies. For the adsorbents such as Anasorb GCB1, Carbopack X, Tenax TA, and Chromosorb 106, the fixed sampling time recommended for most of the VOCs are 8-24 h. Whereas, optimum flow rate of n-hexane, n-heptane, acrylonitrile, benzene, toluene, trichloroethylene, and ethanol are 13.9, 14.3, 20.4, 16, 14.5, 13.1, 11.9, and 20.3 mL min-1, respectively (Kajos et al., 2015). The disparity between the optimum flow rate of each VOCs and their influence on the sampling efficiency has to studied in detail. The preconcentration of VOCs is highly suitable for the ambient/indoor air sample which does not have much fluctuation in the source concentration. Preconcentration air sampling with lower time duration leads to wrong perception and the outcome will be completely different from the actual concentration. Also, preconcentration process is affected by different external factors and most important are relative humidity, temperature variation and wind movement. Presence of isomers are one of the most common interference and also some of low concentration of organic species are difficult to remove from the adsorbent (U.S. EPA, 1999a, b). The well-conditioned CMSGCB shows minimal artefact (<0.1 ng/component) when compared to Tenax TA/GR. Similarly, such sorbents like well-conditioned Tenax TA/GR show still fairly low artefact levels (<1.0 ng/component), although it can increase if the sampling air contains oxidizing agents like O3, NOx, or SOx. Ongoing rapid urbanization, industrialization and population growth brings new types of toxic pollutants and challenges to the air sampling and analytical procedures. Hence, it is highly essential for the periodic review and upgradation of the standards and methodology for the ambient/indoor air sampling and analytical procedures. We gratefully acknowledge the facilities provided by the Indian Institute of Technology Madras, Chennai, India. This research also acknowledges the support made by the R&D Center for Green Patrol Technologies through the R&D for Global Top Environmental Technologies funded by the Ministry of Environment (MOE) as well as by a grant from the National Research Foundation of Korea (NRF) funded by the Ministry of Science, ICT & Future Planning (Grant No: 2016R1E1A1A01940995). Bhargavi, R., Kadirvelu, K., Kumar, N.S., (2011), Vapor phase adsorption of homologous aliphatic ketones on activated spherical carbon, International Journal of Environmental Science, 1(5), p938-947. Hafkenscheid, T., (1997), Diffusive sampling and thermal desorption: an odd couple? The Automatic Methods Group Newsletter, Analytical Division Royal Society of Chemistry, Journal of Automatic Chemistry, 19(2), p55-60. Hilding, J.M., Grulke, E.A., (2004), Heat of adsorption of butane on multi walled carbon nanotubes, Journal of Physical Chemistry B, 108, p13688-13695. Igielska, B., Pecka, I., Sitko, E., Nikel, G., Wiglusz, R., (2002), Emission of volatile organic compounds from textile floor coverings, Roczniki Panstwowego Zakladu Higieny, 53(3), p307-311. Kataoka, H., Ohashi, Y., Mamiya, T., Nami, K., Saito, K., Ohcho, K., Takigawa, T., (2012), Indoor air monitoring of volatile organic compounds and evaluation of their emission from various building materials and common products by Gas Chromatography-Mass Spectrometry. Advanced Gas Chromatography – Progress in Agricultural, Biomedical and Industrial Applications, Mustafa Ali Mohd (Ed. ), ISBN:978953-51-0298-4. Klein, N., Henschel, A., Kaskel, S., (2010), n-Butane adsorption on Cu-3 (btc)(2) and MIL-101, Microporous & Mesoporous Materials, 129, p238-242. Kwon, K.-D., Jo, W.-K., (2007), Indoor emission characteristics of liquid household products using purge and trap method, Environmental Engineering Research, 12(5), p203-210. Llewellyn, P.L., Bourrelly, S., Serre, C., Vimont, A., Daturi, M., Hamon, L., Weireld, G.D., Chang, J.-S., Hong, D.-Y., Hwang, Y.K., Jhung, S.H., Férey, G., (2008), High uptakes of CO2 and CH4 in mesoporous metals organic frameworks MIL-100 and MIL-101, Langmuir, 24, p7245-7250. Onyestyak, G., Otvos, Z., Valyon, J., Kiricsi, I., Rees, L.V.C., (2004), Acetylene sorption dynamics in carbon nanotubes, Helvetica Chimica Acta, 87, p1508-1514. Räisänen, J., Niemelä, R., Rosenberg, C., (2001), Tetrachloroethylene emissions and exposure in dry cleaning, Journal of the Air Waste Management Association, 51(12), p1671-1675. Salthammer, T., Mentese, S., Marutzky, R., (2010), Formaldehyde in the Indoor Environment, Chemical Reviews, 110(4), p2536-2572. Sarwar, G., Olson, D.A., Corsi, R.L., (2004), Indoor particles: The role of terpene emission from consumer products, Journal of the Air and Waste Management Association, 54, p367-377. Tiwary, A., Colls, J., Air Pollution: Measurement, Modelling and Mitigation, CRC Press, Boca Raton, US, (2009). U.S. EPA, (1984), Compendium of Methods for the Determination of Toxic Organic Compounds in Ambient Air, Ohio for Environmental Monitoring System Laboratory, EPA, Research Triangle Park, NC. U.S. EPA, (1990), Compendium of Methods for the Determination of Air Pollutants in Indoor Air, US EPA Office of Research and Development, Research Triangle Park, NC. U.S. EPA, (1995), Characterizing air emissions form indoor sources, U.S. Environmental Protection Agency, Washington D.C. USA. U.S. EPA, (1999a), Compendium Method TO-15: Determination of volatile organic compounds (VOCs) in ambient air using specially prepared canisters with subsequent analysis by gas chromatography, US EPA, Washington, DC, USA. U.S. EPA, (1999b), Compendium of Methods for the Determination of Toxic Organic Compounds in Ambient Air Second Edition, (EPA/625/R-96/010b) Center for Environmental Research Information. U.S. EPA, (2011), Background Indoor Air Concentrations of Volatile Organic Compounds in North American Residences (1990–2005): A Compilation of Statistics for Assessing Vapor Intrusion, report no 530-R-10-001. Weschler, C.J., (2004), New directions: ozone-initiated products indoors may be more harmful than ozone itself, Atmospheric Environment, 38, p5715-5716. Weschler, C.J., Carslaw, N., (2018), Indoor chemistry, Environmental Science & Technology, 52, p2419-2428. WHO Euro Reports and Studies N° 111, World Health Organization, Regional Office for Europe, Copenhagen, (1989). Woolfenden, E., (1996), Monitoring VOCs in air using sorbent tubes followed by thermal desorption-capillary GC analysis: Summary of data and practical guidelines, Journal of the Air & Waste Management Association, 47, p20-36. Yoshimura, M., Senthilnathan, J., (2017), Hydrothermal process for nano-carbons and carbonaceous materials, Nanomaterials Handbook, Second Edition, Ed: Yury Gogotsi, Chapter, 18, p507-533. Ziemann, P.J., (2003), Formation of alkoxy hydroperoxyl aldehydes and cyclic peroxyhemiacetals from reactions of cyclic alkenes with O3 in the presence of alcohols, Journal of Physical Chemistry A, 107, p2048-2060. aPDP: poly-(2,6-diphenyl-)-p-phenylenoxide; aCMS: carbon molecular sieves; aGCB: graphitized carbon blacks; bManufacturer’s data (Adopted and modified from Dettmer and Engewald, Analytical & Bioanalytical Chemistry (2002) 373: 490-500). B: Benzene; T: Toluene; p-X: Para-xylene; Sty: Styrene; aMulti-bed sorbent combination: Carbotrap, Carbopack X and Carboxen 569.